This piece is such a wonderful example of the Art Nouveau style inspired by William Morris. 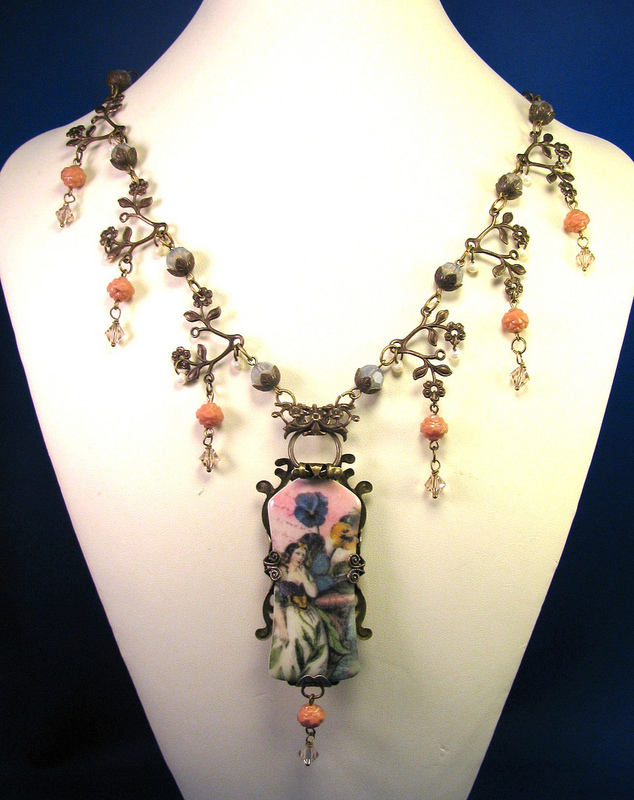 The natural brass in floral shapes blend beautifully with the soft, muted earth tones scattered throughout the necklace, and the fairy like theme matches the dreamy imagery of much of the literature and art enjoyed by the movement. Click here to read more about this piece in Lynda's own words. Thank you Lynda, for sharing this piece with everyone! Wow! Thanks so much for the feature, Melanie. It's always an honor to be chosen as one of ABS's DOTW! You've made my day! It's a stunner! Wow!!! Thank you for sharing this beauty. this is a fantastic necklace indeed ! this necklace is sooooo Gorgeous !!! It combines the colors, themes and over all feel of the beautiful William Morris paper. Its is certainly a Perfect piece for this challenge ! That is gorgeous. I love all the dangles. Very vintage feel to me. So pretty.